Locking bushes are keyless shaft locking devices which use friction to connect from a shaft to a hub. They are designed for ultra fast mounting of several elements such as gears, pulleys, and sprockets. How do locking bushes work? There are two main types of locking bushes which work in different ways. A mechanical locking bush has a number of axial bolts which are tightened to expand tapered cones which in turn grip the shaft and hub. Some locking bushes are designed for hydromechanical purposes, they work mostly by compressing a pressure medium that expands the inner and outer walls of the bush. Loosening the screw will immediately dismantle the bush. This can be repeated a number of times. 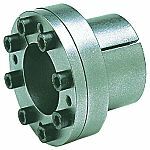 Locking bushes allow a connection without the need for keyways or splines and collars. They are useful where a very high accuracy is required. The main advantages of locking bushes include their easy dismantling, ease of setting, lower machining costs and a backlash free connection without wear or corrosion damage.